MHS Lady Buffalos crush Molalla Indians 69-46, Gladstone Gladiators 70-54 at home. 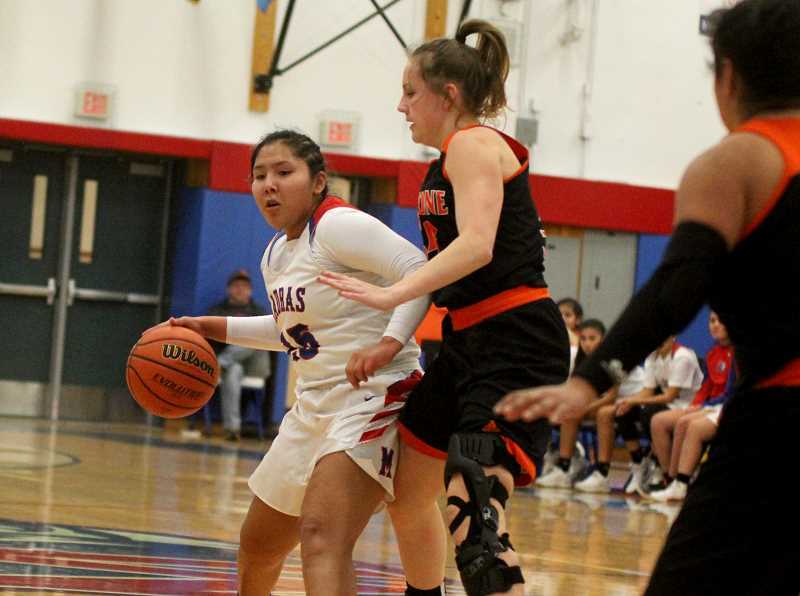 The Madras Lady Buffs came out fast and did not look back in their 69-46 win over the Molalla Indians Friday. Jiana Smith-Francis hit a 3-pointer to start things off for the White Buffalos. Halfway through the first quarter, Madras had a 7-6 lead before back-to-back baskets by Jayden Davis extended the lead to five. A few plays later, Davis a 3-pointer and Smith-Francis scored with about a minute left in the quarter. 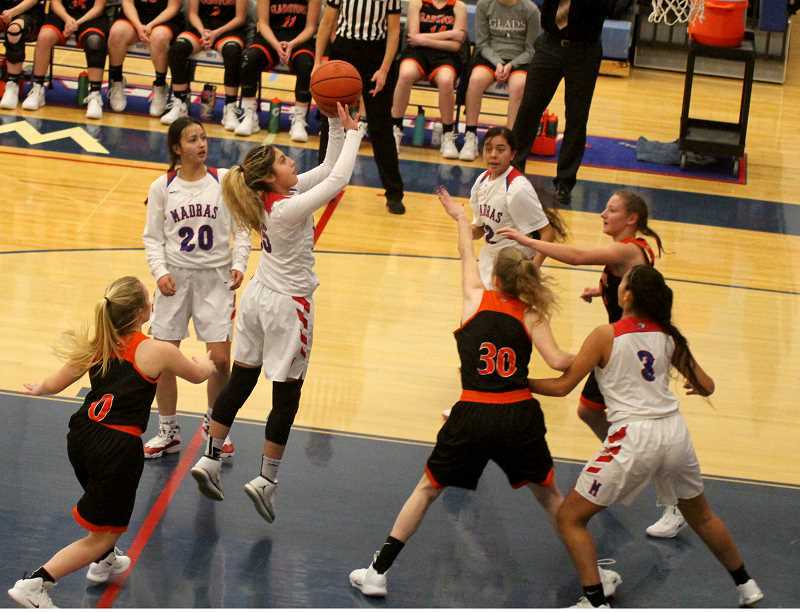 Molalla scored to make it a six-point game, but Smith-Francis hit an open three at the top of the key and Jackie Zamora-Heath scored right before the end of the quarter, giving the Lady Buffs a 21-10 lead. Niya Bagley scored the first basket of the second quarter and Madras took a 13-point lead. After a timeout called by Madras, the Lady Buffs found 3-point specialist Vanessa Culps open in transition. Culps set her feet and buried the deep shot. Molalla went on a small 5-0 run during the end of the quarter, but a pair of free throws by Davis ended the run and sent the Lady Buffs into the locker room with a 30-17 lead. Molalla scored the first five points of the second half and cut the Lady Buffs lead down to eight, before a clutch three by DaRia White put Madras back up by 11. A few plays later, Jalaney Suppah knocked down a shot from behind the arc, but it was matched by a 3-pointer by Zoe Wood, of Molalla. Wood also scored on the next play and Madras had a seven-point lead. Davis scored 6 points in a row for Madras and the Buffs took a 42-31 lead with short time left in the quarter. White hit her second 3-pointer of the game and Erika Olivera scored before the end of the third quarter and Madras went into the fourth quarter with a 15-point lead. The Lady Buffs went on a 10-0 run with less than two minutes left in the game and a big lead. Madras went 4-for-4 at the free line to close out the game. The Lady Buffs made eight 3-pointers as a team and recorded 17 steals. They also not only shot 40 percent from the field, but also shot 44 percent from behind the arc. Davis led Madras in scoring with 17 points and Smith-Francis was behind her with 14 points. White ended the night with 8 points and both Olivera and Suppah finished the game with 7 points. 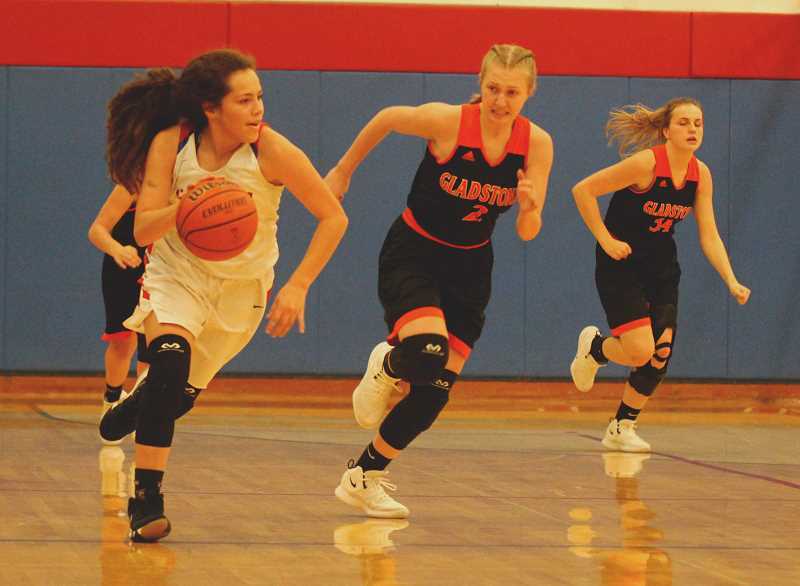 Second half adjustments were the key to the Lady Buffs victory of the Gladstone Gladiators. The Jan. 22 league game was the Lady Buffs' first home game since Dec. 11. Jade Rowley scored the first points of the game for the Gladiators, but a Jiana Smith-Francis three gave Madras a 1-point lead. As the first quarter continued, the Lady Buffs and Gladiators were trading buckets and the lead. Rowley scored again for Gladstone, but the score was answered with a drive by Jayden Davis. With a chaotic start for both teams, Madras head coach Jerin Say called a timeout at the 4:30 mark. Charlie Hill gave Gladstone the lead back for a bit before Jalaney Suppah hit a 3-pointer, giving Madras a 8-6 lead. Aaliyah Asad scored on back-to-back plays and the Gladiators took the lead back. An assist from Smith-Francis to Vanessa Culps led to an easy lay-in and Davis stole the ball and laid it in. A few plays later, with the game tied 12-12, Gladstone head coach, Glenn Hopkins, called a timeout with one minute left in the first. After the timeout, Gladstone score five unanswered points and the Gladiators took a 17-12 lead at the end of the first quarter. Niya Bagley knocked down a jump shot to start the second, but Benay Tatom scored on a post-up for Gladstone and Asad was able to get to the rim, giving the Gladiators a seven-point lead. As the quarter continued, back-to-back baskets by Smith-Francis cut Gladstones' lead down to one. Madras was closing the gap, but Benay Tatom drove to the hoop, made the basket and a free throw after a foul. Gladstone had a 26-21 lead with one-minute left in the first half, before Davis went on a 5-0 run by herself and tied the game at 26-26 at the half. To start the second half, Culps knocked down a 3-pointer, Smith-Francis made a pair of free throws, and Suppah scored. Madras went on a quick 7-0 run, but free throws and a hard drive to the rim by Rowley kept the Gladiators within three. Gladstone scored again to make it a one-possession game, but back-to-back three's by Davis and Suppah gave the Lady Buffs a 39-32 lead. Culps scored on a tough drive to the hoop and Smith-Francis again assisted on a lay-in by Davis. Smith-Francis gave Madras a 45-32 lead with a basket of her own. The White Buffalos were able to maintain a large lead over Gladstone and headed into the final quarter of play up 54-40. The Lady Buffs were able to extend their lead to 17 points, but some free throws and baskets by Asad and Alvarado helped the Gladiators cut the lead down to 12 points. Madras was able to make some late-game free throws and take down Gladstone in an important Tri-Valley league game. The Gladiators and the Buffs both moved to 2-1 in league play afters the Jan. 22 game. Rowley led the Gladiators in points with 16 and Asad was right behind her with 14 points. Madras was led by sophomore Jayden Davis, who had a monster night of 25 points. Smith-Francis also had a big night, scoring 20 points for the Lady Buffs. "We knew we had to step up our play after our loss to North Marion and since this was our home court now, the team knew we needed to play good," Davis said. "We needed to hustle more, stay focused and not get beat, while also watching our fouls and turnovers. This win was really important because our goal is to come back, beat North Marion and finish league 9-1." "I think the team has done pretty good so far, but we still need to step it up in practice, work hard, and make it to state," she said. The girls have a home game against Corbett on Friday. Madras (11-6 overall, 3-1 TVC) will play before the boys and the game will start at 5:30 p.m.